Hello and thank you so much for booking your newborn photography session with me, I am really looking forward to meeting you and capturing some special memories of you and your family. I have included some information below to help you prepare for your session and hopefully answer any questions you might have. What can I expect from my newborn session? My sessions are very relaxed and all I want you to do is have fun with your children, and snuggle your new baby, while I snap away with my camera. I don't need you all to look at me and smile for every single photo. So you don't need to look at the camera, unless I ask you to. I'll meet you at your home at the time we have agreed, kick off my shoes and introduce myself to your family, making sure to chat with older children (if you have them) and explain what I am going to do (this is where knowing about their favourite things comes in very handy, so please do make sure you have filled in the questionnaire I have sent you). It's helpful if you tell your children that a friend will be coming around to take photographs of you all so they know what to expect, it is best not to surprise them. I am primarily a natural light photographer, which means, when I photograph in your home, I use light coming in through your doors and windows to take my photographs. When I arrive I may have a look around your house just to see where the best light is. It would be helpful for me if you can make a note of which rooms have big windows or sunlight coming in the windows at the time when we will be having our session. These tend to be the best rooms to photograph in. TOP TIP: The most helpful thing you can do is snap a few photos of your rooms on your phone and email those photos to me. This helps me plan our session and also gives me an excellent idea of where the light is best in your home. This is the first question most people ask after booking their session. What you wear is important because it can really enhance your final gallery. I want you to feel comfortable in what you are wearing because that will ultimately show through in your photos. The first thing I suggest you do is have a look in your wardrobe and think about your own personal style. We all naturally gravitate towards certain colours and textures. Pick your outfit and then co-ordinate the rest of the family around what you are wearing. Bold, jewel colours (eg: red, yellow, navy) or soft pastels (eg: blue, yellow, purple) can all work very well. Try and keep your colour scheme to three main accentuating colours (too many more can be very distracting). If the thought of picking a colour palette induces panic, neutral colours such as grey, black, white, beige and navy are timeless and can be mixed and matched on their own or with one main, bold colour to great effect. Textures such as linen, cotton, denim, corduroy, silk and lace always photograph wonderfully. Once you have picked your outfit, have a look at the rest of the family and co-ordinate with complimentary colours and textures. I do strongly suggest avoiding the matchy-matchy look (everyone is black t-shirts and denim will seriously date your photos). Also try to avoid large brand names or logos on clothing as they can be distracting. These images will be in your family for generations to come - so it's definitely worth putting some thought into what you might like to wear. Do I need to tidy up for an in-home session? You do not need to de-clutter your entire home before a session, (after all your house reflects your unique personality which is what makes in-home sessions so great) but you just need to be aware that whatever is in the room will end up in the frames I shoot. What happens if my baby is crying? The main reason I always do newborn sessions in the morning is because this is when your baby is likely to be the most settled. But I do not want you to worry if your baby is fussy during our session. The beauty of a newborn lifestyle session is that I don’t need your baby to do anything that they wouldn’t normally be doing. Some babies need to be in their parents arms at all times and that is just fine, if this is your baby, then this is where I will take photos of your baby - in your arms, just as they always are. If your baby is awake, I’ll get lots of photos of them making cute facial expressions and, if they are asleep - well don’t they just look adorable when they snooze? It helps if you are able to feed your baby about 15minutes before I arrive, but if your little one is hungry during our session, then I always make sure we have plenty of time for you to feed them. A newborn photography session should in no way be stressful, it is - after all - a celebration of one of the most special and life-changing times of your life. Please rest assured that I don't want your children to be anything other than themselves. I don't need them to sit still or 'be good', I have a 3-year-old and a 4-year-old who point-blank refuse to pose for me, I've become an expert in taking photos on the run and I have a lot of tricks to make sure that I get those lovely, connected family photos that you are after. Please do not bribe your children to behave for me, I find this never works (especially if sweets are involved). Of course you know your children best and if you want to give them something as a treat at the end of the session as a motivating factor, that is entirely up to you. If you have toddlers or small children, please don't worry if they have a tantrum or a meltdown during our session. It's my job to make sure you get the kinds of photos you see in my portfolio and I can guarantee that melt-downs routinely happen at every single session I do that involves small children. If your child becomes upset, we'll take a break, distract them and make sure they are happy before continuing. Older brothers and sisters don’t always want to snuggle their newest sibling (especially infront of a camera) and I very often find that toddlers and younger children will at first refuse to join in. Please do not worry about this. As you already know, trying to get a toddler to do something they don’t want to do usually means a meltdown. I usually encourage them to play with a special toy, or have some fun with dad while I take photos of mum and the baby. I can absolutely guarantee that if they are left to their own devices for a bit, they’ll soon want to be involved in what is going on. 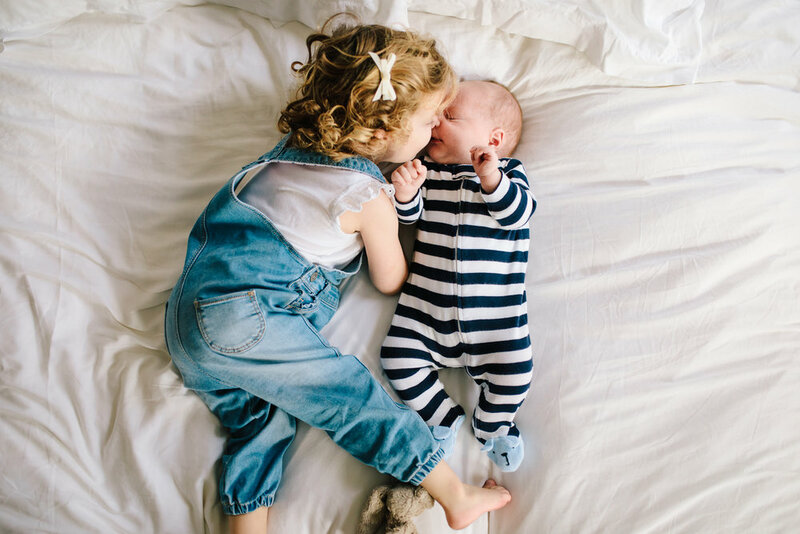 Of course, if they can’t wait to show off their brand new baby, we’ll make sure we get those heart-melting sibling and family shots in first before we move on. I find it helps (especially with toddlers) if we have snacks and a drink on hand if we need to take a break for little ones to refuel. I generally let the children lead our sessions. I want them to be fun so that you all enjoy the experience (yes, even you Dads!). So I tend to play a lot of silly games - incorporating movement into my photographs is always important to me. My goal is to keep them engaged in what we are doing so that they stop noticing the camera. I promise to get your full gallery to you within 10 days of your session. I normally do an initial edit and I like to post some of my favourites on my social media accounts within a few days of our sessions as this helps me promote my business. If you do not want me to share your photos, please do let me know. Your gallery will be live for three months so that you can download, save and print your photos. If you haven't already done so, please would you fill in the questionnaire I have sent you. Having your contact details, the names of your family members and knowing a little about your family in advance of our shoot helps me to get the most out of your session and capture unique images that reflect who you truly are, right now. If you have any further questions or want clarification on anything mentioned above, please do not hesitate to message, call or email me. I can't wait to meet you and photograph your family!